SAUGERTIES, NY (August 4, 2014) – Kevin Babington and Shorapur were on the brink of their second grand prix win in a row at HITS Saugerties as they approached the fifth fence of Sunday’s jump-off. They were on track to best 15 contenders when Babington’s martingale got caught on his rein. Redemption came six trips later for Babington of Gwynedd Valley, Pennsylvania, as the dependable Mark Q carried him to the top. The pair won the $100,000 Strongid© C 2X™ Grand Prix presented by Zoetis, taking home a $30,000 check. Laura Chapot of Neshanic Station, New Jersey jumped clear in the first go of the class aboard Mary Chapot’s ISHD Dual Star and set an immediate Great American Time to Beat in the jump-off. Their time of 45.28 seconds stood for nine rounds until Babington and Mark Q returned to rival. “I saw the trip before me – fast with a couple down – and knew if I stayed on that track I would have a chance,” he said. In it to win it, Babington’s plan proved perfect as he stopped the clock at 44.84 seconds. Four more would challenge Babington, but none could crack Ylänne’s course quick enough to take the lead. Callan Solem of Glenmoore, Pennsylvania was close though, piloting VDL Wizard to a time of 45.06 seconds for Horseshoe Trail Farm, LLC. Solem settled for second, while Chapot landed third. Babington and Shorapur ended fourth on 46.07 seconds, adding another ribbon to their Week VI collection. Christine McCrea of East Windsor, Connecticut rounded out the top five in the irons of Candy Tribble’s Wannick WH in 49.92 seconds. 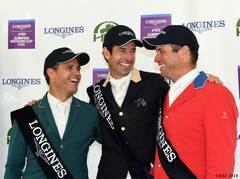 Mark Q and Babington placed in five of their last six international grand prix and have their sights set on the Zoetis $1 Million Grand Prix at HITS Saugerties this September. Sunday’s grand prix was the final Zoetis Million qualifying opportunity of the summer series before moving to HITS Culpeper August 13-17 and 20-24. Qualifying returns to HITS Saugerties August 27-31, presenting million-dollar hopefuls with the final two chances to punch their tickets to the HITS Championship before Week VIII’s Wild Card Grand Prix. Kevin Babington jumps to his second grand prix win at HITS Saugerties VI. Sunday's win came on Mark Q in the $100,000 Strongid© C 2X™ Grand Prix presented by Zoetis. Tony Hitchcock and Lindsay Yandon of HITS present Kevin Babington and Mark Q with winner's awards, including a Horze Equestrian cooler, after the $100,000 Strongid© C 2X™ Grand Prix presented by Zoetis at HITS Saugerties. Building on 60 years of experience as Pfizer Animal Health, Zoetis delivers quality medicines and vaccines, complemented by diagnostics products and genetics tests and supported by a range of services. They work every day to better understand and address the real-world challenges faced by those who raise and care for animals in ways they find truly relevant. Zoetis produces a comprehensive range of safe and effective products, including equine vaccines, dewormers and sedative analgesics, to help professionals and individual horse owners keep their animals healthy. Both veterinarians and horse owners know and trust the Zoetis will help their horses live longer, healthier lives. For more information, visit Zoetis.com.